The book of the week was Pitch Anything by Oren Klaff. Wow. I haven't been this excited about a book in quite some time. I have found myself talking about this book a lot this week. I have even suggested it to several of my friends that sell for a living and I did so without getting to the end yet. Klaff is a dynamic writer and the whole book is fascinating. I have read a ton of books and what I look for in books anymore is uniqueness... A lot of books overlap ideas when you get into the realm of business and leadership. The books that do well nowadays are the ones that have a few individual revelations. The ones that do great are the ones that completely revolutionize their subject matter. 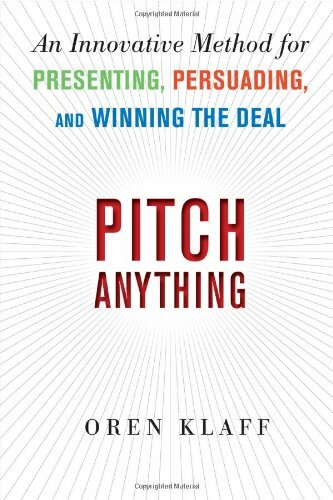 Pitch Anything is one of those books. There are a lot of "Oh wow" ideas in this book. Klaff uses neuroscience in selling. He has analyzed the way the human mind reacts to communication and teaches best practices for selling. There are two things I want to lay on you that I learned from this book. The first about attention and the second is about neediness. Obviously it's important to get attention when you are selling to someone. This is obvious, but most people don't know how to get that attention. A lot of salesmen may think they do, but a lot are wrong. Attention is the combination of two things: desire and tension. Not only do you need to have someone interested but you also need them thinking that it's going to be on your terms whether they get it or not and they would be lucky to have it. Desire is the easy thing. You have a great product or service and you pitch how wonderful it is to your customer or financier. You are most likely passionate about what you are selling, so it should be easy to find ways to incorporate the other party into that desire. Klaff talks more in depth about the ways to really drive in this desire as well. The desire releases the neurotransmitter dopamine, this is half of the cognitive cocktail you're after. Tension on the other hand is not as easy to create. You have to push and pull while you are pitching. "I'm not sure if we are the right fit" *Pause* "But then again if things do work out, this could really be something great." This is a low-key example. The first statement pushes them and mentally they are thinking, "Wait, what, why can't I have this" and then you pull them in with your second statement. Be convincing while you are doing you pushes and pulls or they won't work. And if you pull it off you will release the neurotransmitter norepinephrine. This is the second half of the cognitive cocktail. It makes them pumped to want what you are selling. Dopamine is the chemical in the brain that chases rewards and norepinephrine is the chemical that helps your brain stay focused. If you are able to learn to communicate in a way the releases both of these in the person you are talking to, you need to learn it! The second thing I really liked was Klaff talking about not being needy. If you appear needy it gives the other party all the power. You want to have the power in your pitch. It is incredibly common for salesman to do everything but beg (maybe some beg too) to get the sale. And you probably do "need" it... or at least you think you do, but do not wear that on your sleeve. I read an article a couple years ago about the best sales people in the nation. There was a Car Salesman that sold more cars than anyone else and the way he did it was act like it was no sweat off his back if they didn't buy the vehicle. It was his propensity to avoid neediness that really sold his cars. Needy doesn't work. Keep the control and maintain utter confidence. This book is very interesting. I could spill tidbits I learned all night long, but I don't have the time. Instead, I encourage you to pick this book up. It is incredibly interesting. And if you are sitting there saying that you don't sell... you're wrong. Everyone sells. It may not be your main career, but whether you are asking for a raise at your job or even interviewing for a job, you are trying to sell yourself. As always, if you have any questions on the book don't hesitate to ask. I would be more than happy to help anyone that wants it.